CSX Transportation (it’s name deriving with the “C” standing for Chessie, “S” for Seaboard, and “X” an all-encompassing multiplication symbol that “together we are so much more”) is the railroad division of CSX Corporation, the latter of which was originally created in 1980 as a holding company for several subsidiaries. Today, its system comprises some 21,000 route miles with more than 36,000 employees. It ranks third among Class I's with $11.81 billion in annual revenue as of 2015. However, the road has had a somewhat tumultuous history during its past 30 years of operation, criticized for various decisions carried out over its network in regards to abandonment of property, cutbacks in other areas, and a general lack of living up to its predecessor's standards. Historically, the road can trace its roots back to America's first common-carrier, the Baltimore & Ohio while other parts of its ancestry include the Chesapeake & Ohio, Western Maryland, Seaboard Air Line, Atlantic Coast Line, Louisville & Nashville, and Clinchfield. 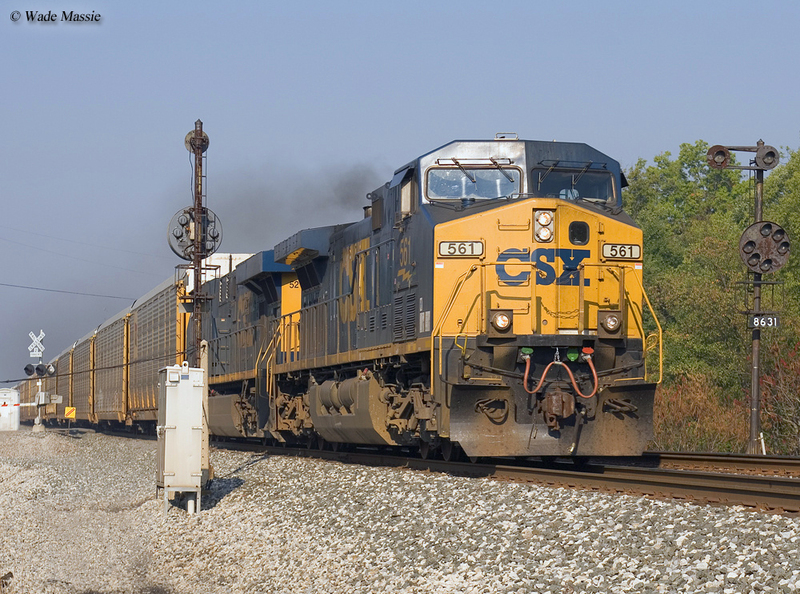 CSX Transportation's corporate history as a stand-alone railroad has only entered its fourth decade, relatively young by industry standards. Its creation was brought about by the formation of CSX Corporation on November 1, 1980, a holding company which controlled rail and non-rail assets. 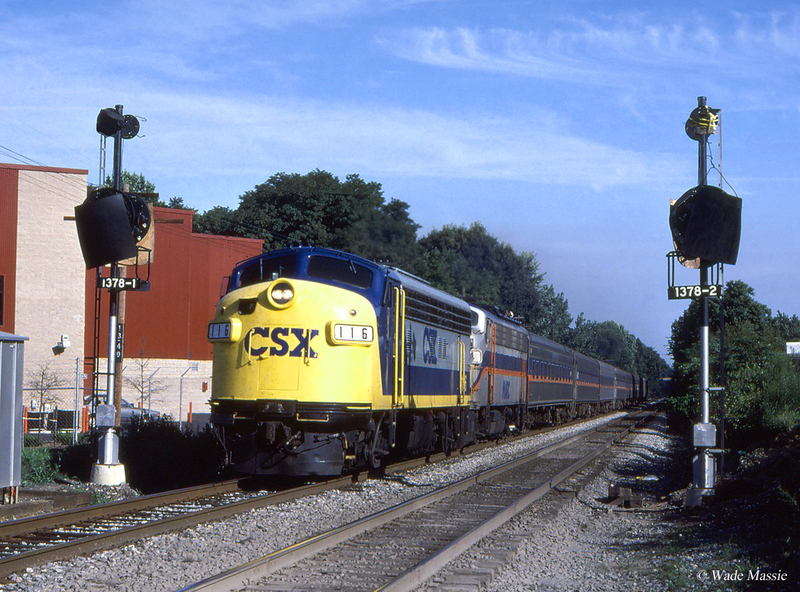 As the formal union of what as then Chessie System and Seaboard System slowly came together during the 1980s, CSX Transportation (CSXT) was born on July 1, 1986 to operate the company's railroad division. While the southern roads were merged into their holding company on December 29, 1982 (Seaboard System, whose name disappeared with CSXT's creation) the Chessie System roads had only operated under the guise of that name since its 1973 creation. According to Trains Magazine, the Western Maryland was the first to disappear, merged into the B&O on May 1, 1983. The B&O and C&O survived as "paper" companies for nearly a year into the CSXT era: B&O vanished into the C&O on April 30, 1987 (ironically it had just celebrated its 160th birthday on April 24th). Finally, the C&O was formally dissolved as a corporate entity on August 31, 1987. After the merger proceedings of the 1980s were complete, the new railroad became the largest east of the Mississippi, dwarfing the then recently formed Consolidated Rail Corporation ("Conrail," a government created and financed entity to restore order to the northeastern rail market that went belly-up after the Penn Central disaster), Norfolk & Western, and Southern. The latter two roads merged a few years later in 1982 to form Norfolk Southern although the NS of that time remained much smaller than its rival. However, unlike the Chessie System, which was an efficiently operated and well-managed railroad these practices never truly carried on into the new company. Despite the fact that CSX Transportation was much larger than NS, the latter consistently earned higher profits with an overall lower operating ratio. As an NS employee once stated, “If CSX ever learns how to run a railroad we could be in real trouble.” In addition, after Hays T. Watkins (the railroad's first chairman) left CSXT in 1988 the railroad seemingly lacked an effective management system until the mid-2000s. Today, it is coming on strong as one of the most efficiently operated railroads in the country (as of mid-2010 it posted its lowest operating ratio ever). 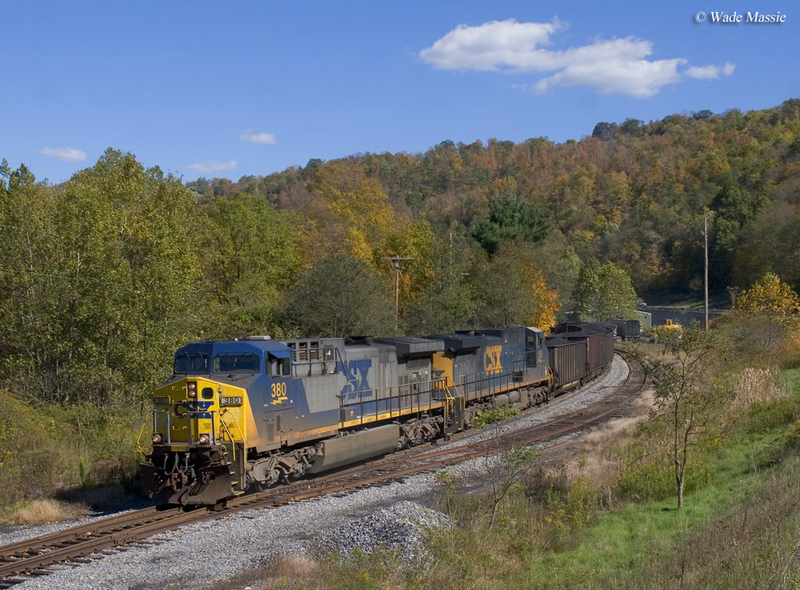 While CSXT never suffered from the corporate culture issues Penn Central experienced with its employees, it still struggled to find an identity. It has long been stated that former Seaboard and Chessie people did not see eye-to-eye on many things and this carried over into the corporate logo. There was no general agreement about what this should be or how it would appear. Tom Dixon states in his book, "The Chessie Era," that at first the new company had absolutely no plans to use the initials "CSX" on its locomotives or equipment. However, sure enough, by 1986 it began appearing and the initial design featured a simple grey-dip scheme with blue trim and lettering: dubbed the "Stealth" lvery by railfans, according to the "Bull Sheet" the first locomotives to wear it were B30-7's #5508 and #5511, which rolled out of the shops in Waycross, Georgia on May 6, 1986. A year later, full-scale production began of repainting predecessor units. Baltimore & Ohio: The B&O holds the distinction of being the country's first common-carrier railroad, originally chartered on February 28th, 1827 and officially incorporated and organized on April 24th, 1827. It was the vision of Baltimore businessmen and city leaders who felt they needed a better means of transportation to effectively compete against the Erie Canal which connected New York City with the Port of Albany at Buffalo. During that time the eastern port cities fiercely competed with one another. Over time the B&O blossomed into a 10,000 mile network linking 13 states and connecting New York, Philadelphia, Baltimore, and Washington D.C. with Cumberland, Pittsburgh, Cincinnati, Toledo, Detroit, Chicago, St. Louis, Indianapolis, and briefly Kansas City. It struggled to keep up with the Pennsylvania and New York Central railroads but held title as the third major trunk line in the East. In 1962 it was purchased by the Chesapeake & Ohio although remained largely independent until the Chessie System era after 1973. Chesapeake & Ohio: Without question the C&O was the strongest and most profitable system in the Chessie System family (the holding company's very name was the product of an earlier C&O marketing sensation, Chessie the kitten). Its earliest roots trace back to Virginia's Louisa Railroad of 1836 while its most prominent predecessor was the Virginia Central. In 1867 the Chesapeake & Ohio Railroad was formed, which came under the control of noted tycoon Collis Huntington in 1869. The C&O expanded prodigiously during the 1870s by either building new railroad or acquiring smaller systems. It was reorganized as the Chesapeake & Ohio Railway in 1878 and by World War I stretched from Chicago to Norfolk/Newport News via Charleston/Huntington, West Virginia It thrived on the rich coal fields of southern West Virginia while its link to the Windy City offered substantial through freight. On June 6, 1947 it formally acquired the Pere Marquette Railway, offering access throughout Michigan and a link to Buffalo. Western Maryland Railway: The smallest member of the Chessie family was the Western Maryland, born in 1852 as the Baltimore, Carroll & Frederick Railroad. This system was chartered by the Maryland General Assembly on May 27th to connect Baltimore with Hagerstown in Washington County. 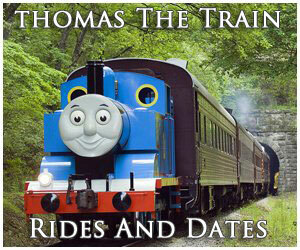 It was renamed as the Western Maryland Rail Road Company on March 21, 1853 and construction began on July 11, 1857. In 1902 the railroad was acquired by the Fuller Syndicate, led by George Gould. He had hopes of using the WM as a link in his ultimate plan to form a true, transcontinental railroad under common ownership. While this plan failed Gould did succeed in expanding the WM's reach; it opened an extension to Connellsville, Pennsylvania in 1912 (via Cumberland) and its 1905 acquisition of the West Virginia Central & Pittsburg Railway provided access to the east-central coal fields of the Mountain State around Elkins. Due to Gould's overreach, the company fell into bankruptcy in 1908 and emerged in 1910 as the Western Maryland Railway. In 1964 the WM came under B&O control and slowly lost its identity after the Chessie System era. Today, most of its network has been abandoned. Enthusiasts who closely follow the company have attached names to its various paint schemes over the years which, interestingly, have changed little during that time. Through the many various subtle alternations the three significant changes include the following; during the early 1990s, for better visibility yellow was introduced to the skirting, nose, and aft end of locomotives. Later, in the early 2000s, CSX replaced the grey entirely by featuring a new, deep blue scheme with yellow lettering and trim, somewhat similar to the late B&O and C&O designs. A decade after this updated book place the design was altered to include the so-called "Boxcar Logo" featuring a basic boxcar shape around the CSX stencil. Most observers agree that, despite some stylistic changes from time to time, the font used for "CSX" has always remained Lubalin Graph Bold. Mr. Watkins’ leadership of the 1980s provided a great deal of assistance during the early years when the company was just coming together as it attempted to work out the typical logistical and managerial issues associated with any large merger. However, his departure was not the beginning of the railroad's problems. 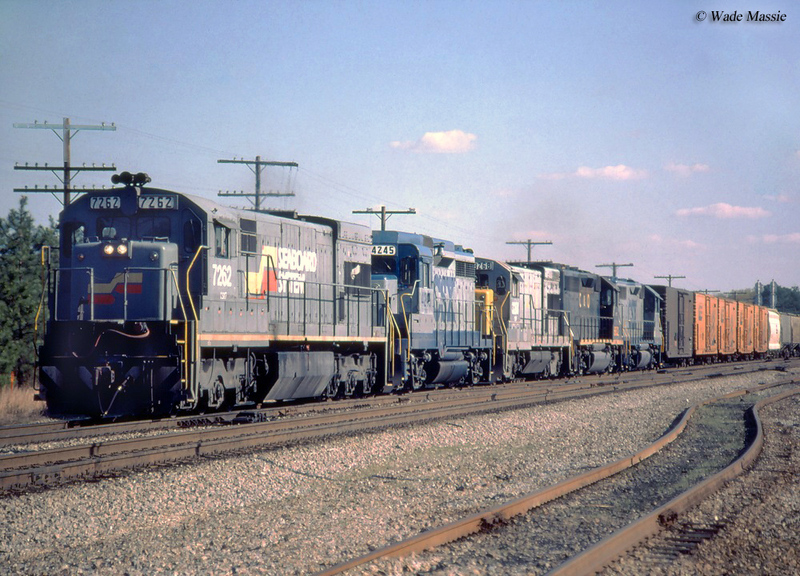 In the mid-1970s then-Chessie System took steps to pare down what it deemed superfluous or redundant segments; unfortunately, the Western Maryland was hardest hit since it paralleled the B&O in many locations (although, ironically, its newer routes through western Maryland and Pennsylvania offered better grades). Then, during the 1980s the B&O was cut up; in a highly controversial move that remains so to this day its St. Louis Gateway main line (Baltimore - St. Louis) was severed from Clarksburg to Parkersburg, West Virginia (the "Parkersburg Branch") as was much of the Ohio Division. 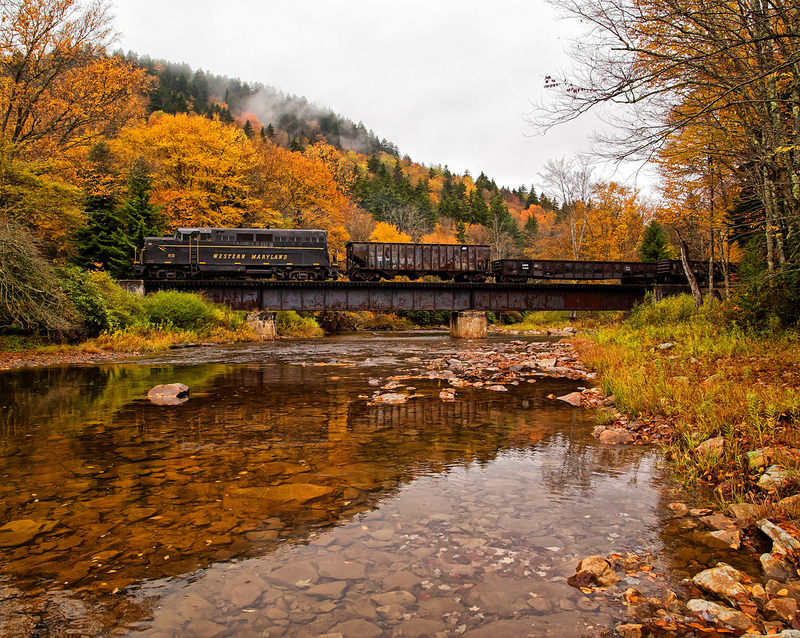 Despite its ruggedness across the Mountain State the direct east-west route was a tailor-made intermodal corridor and the B&O/Chessie made use of it as such when the COFC/TOFC (container/trailer-on-flatcar) revolution took off in the 1960s and 1970s. Ironically, after pulling the plug the railroad was left without a competitive container route until its acquisition of Conrail in 1999. There were also key segments of the Seaboard Air Line and Atlantic Coast Line abandoned while talks continue today about potentially rebuilding some of these routes for passenger service. Even the Chesapeake & Ohio, architect and most profitable component of the Chessie System, has not been immune as much of its Chicago line was abandoned across Indiana. These moves, and others, have drawn CSXT a great deal of criticism both in and outside of the industry. Looking back, at the time of the B&O abandonments, CSX was attempted to save money and cut costs on routes that were expensive to operate or generally redundant. The Parkersburg Branch was indeed operationally expensive while its numerous tunnels restricted the amount of through traffic it could handle (double-stacks could not fit through the bores). Ironically, a major upgrade to the corridor had occurred under the C&O in the 1960s (lowering floors and daylighting tunnels) for the very purpose of making it competitive and efficient for intermodal service. 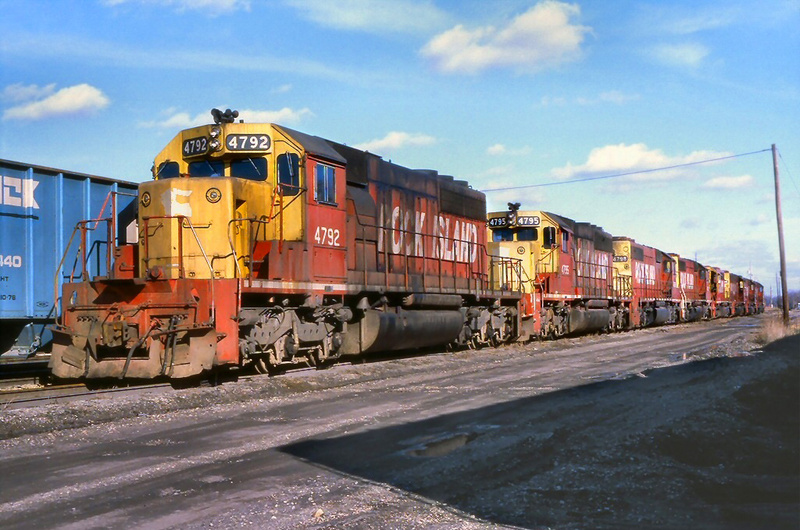 Had the railroad then known that double-stack containers would comprise such a large percentage of rail traffic only a few decades later it certainly would have spent the extra time and slightly additional expense to upgrade the line for this freight. Sadly, in the succeeding years much of the B&O has continued to either see abandonment or sale, especially in West Virginia where only a segment of the West End and Ohio River Subdivision remain (along with a few branches). Today, its only vital route seeing considerable use is the former Chicago main line. 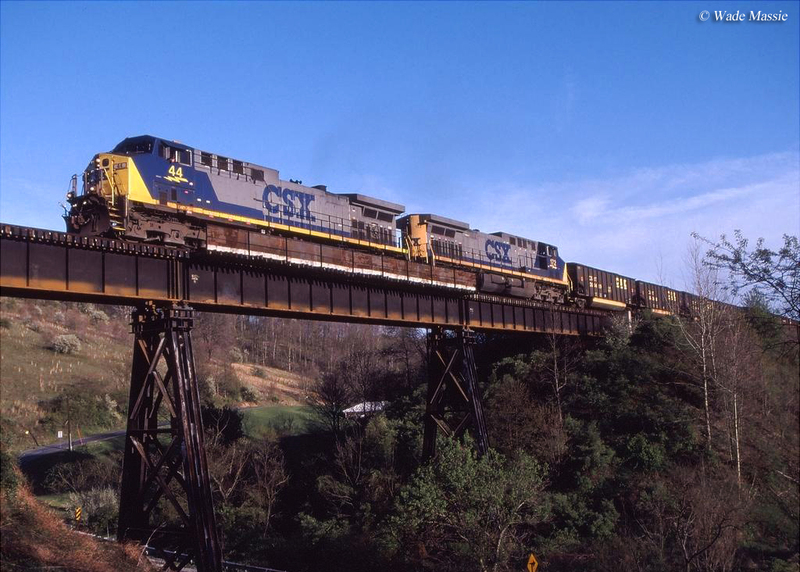 Into the 1990s, CSX Transportation saw further expansion when it fully absorbed the vital bridge route known as the Richmond, Fredericksburg & Potomac in 1991. This road's busy main line ran between Washington, D.C. and Richmond, Virginia and had long been operated by numerous railroads until CSX found itself as sole owner. Atlantic Coast Line: The ACL formed one component of the 1967 Seaboard Coast Line merger with Seaboard Air Line. 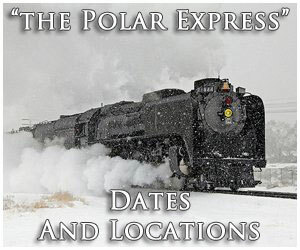 Its ancestry can be traced back to the Petersburg Railroad of 1830, chartered to connected Petersburg, Virginia with Weldon, North Carolina. Several systems later came together to form the Atlantic Coast Line Company of 1893, which connected Charleston, South Carolina to Richmond, Virginia. There were additional takeovers in the early 20th century, notably the Plant System of Florida acquired in 1902. By the late 1920s, the ACL operated from Richmond and Norfolkt o Miami, Tampa, and throughout most of Florida. It also stretched across the Southeast to Birmingham, Atlanta, and Montgomery. The road was always well managed and enjoyed a booming passenger business into the 1960s thanks to vacationers flocking to the Sunshine State. Its merger with the Seaboard Air Line was approved in 1963 and formally took place on July 1, 1967 creating Seaboard Coast Line. Clinchfield Railroad: The fabled Clinchfield was a small but important operation moving millions of tons of coal along its main line stretching from Elkhorn City, Kentucky to Spartanburg, South Carolina via Western North Carolina. It began as the Louisville, Cincinnati & Charleston of 1836 with grand intentions of linking the Ohio River and Atlantic seaboard. By the 20th century a successor known as the Ohio River & Charleston was operating 171 miles from Camden, South Carolina to Marion, North Carolina. Most of this system was purchased by the Southern Railway and Chesapeake & Ohio while the central segment near Johnson City, Tennessee came under the direction of George Carter. He incorporated the Carolina, Clinchfield & Ohio Railway on March 31, 1908 which operated the property and other short sections under his control. After years of work and numerous tunnels, an engineering marvel through the southern Appalachians emerged on February 9, 2015 when the CC&O's 277-mile, Elkhorn City-Spartanburg main line opened. It handled heavy coal traffic and other freight while linking Midwestern carriers with those of the South via an inside gateway. On May 11, 1923 the L&N and ACL formally leased the CC&O, operating it under the guise of the "Clinchfield Railroad." 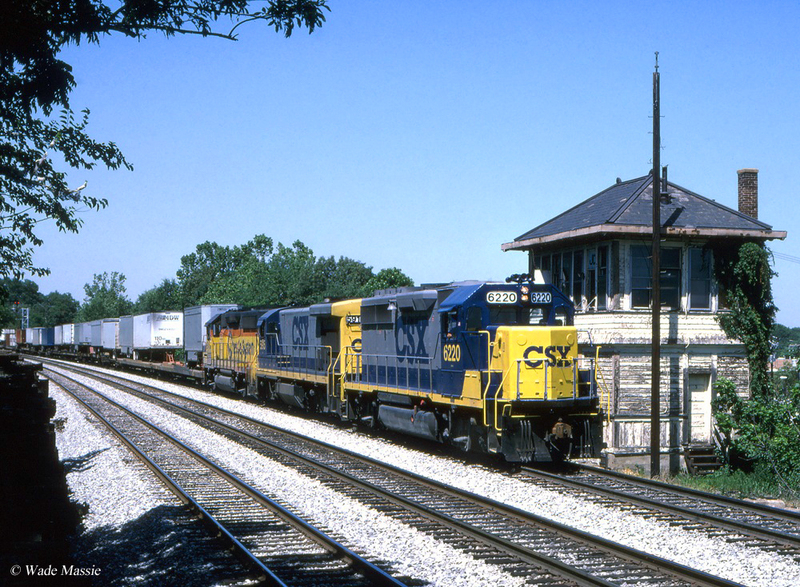 Louisville & Nashville: One of the most important components of CSX's southern network is the former L&N lines. This highly profitable road traces its ancestry back to 1850 when the Commonwealth of Kentucky chartered the Louisville & Nashville Railroad to link its namesake cities, opening nine years later in 1859. The L&N's corporate history survived for over a century as it built and gobbled up smaller roads, such as the Nashville, Chattanooga & St. Louis (1880), while expanding across the Southeast. By 1950 it operated nearly a 5,000-mile network from Cincinnati and St. Louis to Memphis, Knoxville, Atlanta, Birmingham, Pensacola (Florida), and New Orleans. It finally reached Chicago in 1969 by acquiring the Chicago & Eastern Illinois with which it had interchanged for many years from Evansville, Indiana. The L&N's traffic base was incredibly diverse ranging from coal and lumber to automobiles, chemicals, and general merchandise. In 1971 it acquired the Monon before joining the Family Lines consortium in 1972. Monon Railroad: The Monon disappeared into the L&N in 1971 and as a part of the later CSX Transportation has played a very small role. The Midwestern road was situated almost entirely in its home state of Indiana, long known as the Chicago, Indianapolis & Louisville. Its earliest predecessor was the New Albany & Salem conceived to connect Salem, Indiana with the Ohio River at New Albany. By 1854 it was opened to Michigan City along Lake Michigan. Following a reorganization and bankruptcy it was known as the Louisville, New Albany & Chicago Railway by 1882. It acquired smaller roads to remain competitive, such as the Chicago & Indianapolis Air Line and Kentucky & Indiana Terminal. These efforts, and new construction, put it into Indianapolis, Louisville, and Chicago (thanks to trackage rights over the Chicago & Western Indiana) by the end of the 19th century. In 1897 it was reorganized as the Chicago, Indianapolis & Louisville. At its peak size the system, stretching 573 miles, resembled an "X" with Monon, Indiana as the converging point of its main lines. Alas, much of the Monon is abandoned today. Seaboard Air Line: The SAL's heritage began as the Portsmouth & Roanoke Rail Road chartered in 1832 to connect its namesake cities, completed in 1835. It was later reorganized as the Seaboard & Roanoke in 1846 and linked with the Raleigh & Gaston in 1853 to provide a continuous route from Portsmouth to Raleigh. Under the leadership of John Robinson, the Seaboard Air-Line System name first appeared for marketing purposes which included the R&G, S&R, and Raleigh & August Air-Line. The latter road offered a southerly link to Hamlet, North Carolina. Finally, on April 14, 1900, the Seaboard Air Line Railway was incorporated which comprised more than a dozen predecessors linking Richmond, Virginia with parts of Florida. At its peak size the SAL covered more than 4,000 miles from Virginia to parts of Florida while also stretching westward to Atlanta, Montgomery, and Birmingham. Despite a bankruptcy brought about by the Great Depression the SAL was generally a strong road until entering its formal union with the Atlantic Coast Line. 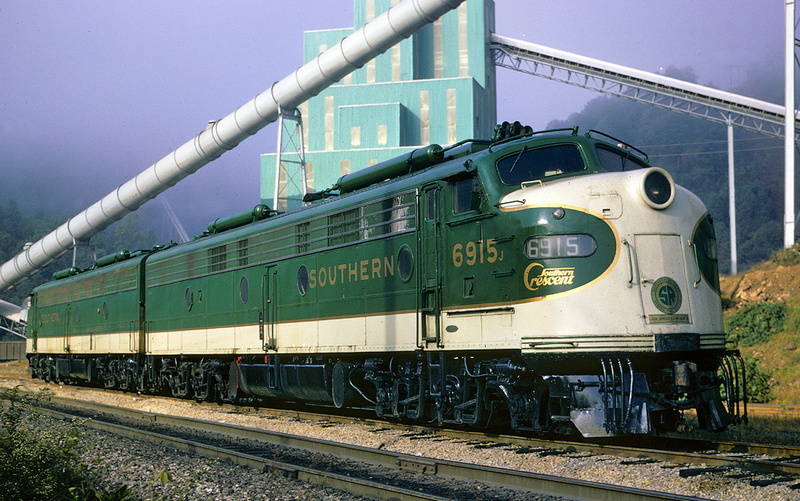 In 1972 the SCL joined the Louisville & Nashville, West Point Route, and Clinchfield to form the Family Lines System. This was only a marketing term and carried no corporate weight whatsoever although a colorful livery adorned new and repainted locomotives. In 1982 all three merged to form the Seaboard System. West Point Route: The smallest component of CSX was the so called Georgia Roads, referring to as the "West Point Route." The three railroads in this marketing family included the Atlanta & West Point Railroad, Western Railway of Alabama, and Georgia Railroad. The latter controlled the others; the A&WP linked Atlanta with West Point, the WRoA connected westward to Montgomery and Selma, and finally the Georgia Railroad ran from Atlanta to Augusta with branches to Athens, Monroe, Macon, and Washington. The GARR came under the control of the L&N and Central of Georgia although the latter sold its interest in 1944. The West Point Route joined the Family Lines System of 1972 and disappeared into the Seaboard System a decade later. Only a year later, on September 11, 1992 it took control of the Pittsburgh & Lake Erie, a small, historic regional that connected northeastern Ohio with southwestern Pennsylvania via Pittsburgh. It had long been under New York Central control but regained independence following the Penn Central bankruptcy and managed to remain so when Conrail was formed in 1976. The most significant addition was the 1999 purchase of Conrail, cut up in conjunction with Norfolk Southern that year; it proved a very costly battle for the Northeastern carrier, which had direct access to the large markets of Philadelphia, Boston, and New York City. The fight was eventually settled with a split of the railroad; CSX agreed to 42% while NS purchased the larger, 58% segment. As it turns out both CSX and NS had logistical problems to integrate their segments although they managed to largely avoid the issues Union Pacific experienced in its 1996 takeover of Southern Pacific. Of the two, Norfolk Southern experienced a better transition, mostly because of the management practices the railroad had put in place since the days of the Southern and Norfolk & Western. 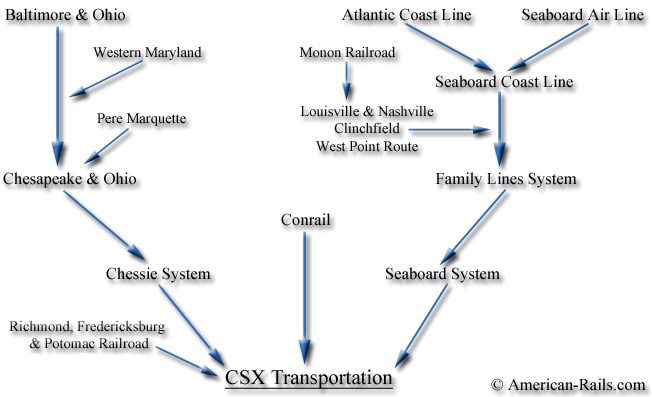 The above map gives a general family tree of the largest railroads which make up the current CSX Transportation system. While its future is as much of a guess as its past, many in the industry and those who study it see two mega-railroads evolve with CSX merging with one of the western railroads and Union Pacific likely joining with Norfolk Southern. The most recent event to occur in this regard was the 2014 approach from Canadian Pacific about a possible merger. CSX declined the offer but, interestingly, CP went on to court Norfolk Southern about such a union in late 2015/early 2016. Following a few months of tense back and worth NS flatly rejected the idea, along with follow up inquiries from the Canadian road. If the merger with either of the eastern Class I's had taken place the industry would surely have witnessed a final round of mega mergers, producing the two giant North American systems previously mentioned. Today, including CSXT, CSX Corporation carries out business in the following areas: CSX Intermodal Terminals, CSX Real Property, CSX Technology, Chessie Computer Service, Cybernetics & Services, Total Distribution Services, Transflo Corporation, Fruit Growers Express, CSX de Mexico, Winston-Salem Southbound Railway (shared ownership with Norfolk Southern), and Powerhouse Logistics. Whatever happens with CSX Transportation one thing is certain; it is a railroad rich in history, which stretches from the Northeast to the Southeast, and points west to Chicago and New Orleans. Perhaps one day, before the merger movement begins again the railroad will find its true identity and direction with an efficient and effective management team.